The buyers that Toshiba targets with its luxury Kirabook wouldn’t touch a Satellite L55Dt-A5253 if Neiman Marcus was giving them away. That’s too bad, because this laptop actually offers a much better price-to-performance ratio. Toshiba selected AMD’s 2.0GHz A6-5200 APU to power this $650 notebook. That chip features an integrated AMD Radeon HD 8400 graphics processor, which helped Toshiba secure a second-place finish in the games portion of our benchmark suite. But the machine’s 6GB of DDR3 memory runs at only 1333MHz, which held its performance back in comparison to some of the laptops equipped with Intel CPUs and faster DDR3/1600 memory. 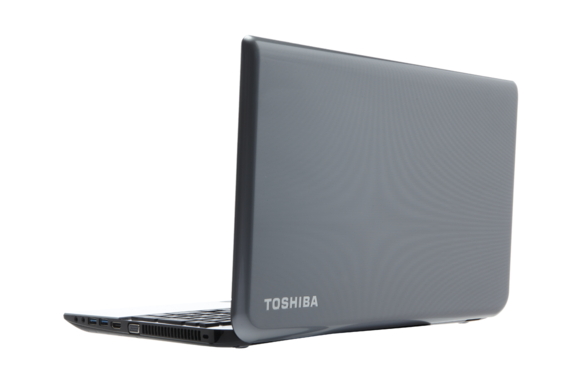 Toshiba's Satellite L55Dt-A5253 uses AMD’s A6-5200 processor, which has an integrated Radeon HD 8400 graphics processor. Like most notebooks in its price range, the Satellite is composed primarily of plastic, but Toshiba’s attractive material does a nice job of resisting smudges and fingerprints. 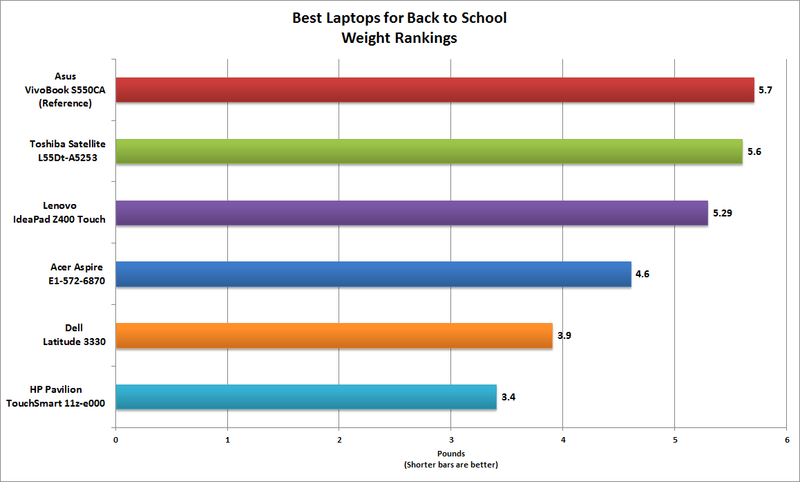 The computer’s lid and chassis also feel more rigid than most, though it does weigh a full pound more than the Acer Aspire E1—a significant consideration if you’ll be carrying your laptop on your shoulder for extended periods every day. The Satellite L55Dt features a 15.6-inch, LED-backlit touchscreen display with a native resolution of 1366 by 768 pixels. The display is attractive enough, if you position it just so. Text appears most legibly when the screen is tilted back; but bring it even slightly forward—as you might have to do when using the computer on your airline tray table, if the passenger in front of you decides to recline—and you may not be able to read it at all. 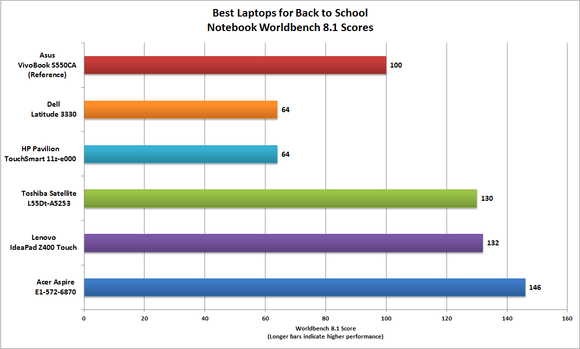 The Toshiba Satellite is one of the more attractive notebooks on the market. If your arms get tired from reaching out to stroke the Satellite’s screen, you can use its touchpad, instead. The touchpad is centered beneath the keyboard, so it’s off center from wrist rest, but that’s where it should be. It supports all of the usual Windows 8 gestures, including two-finger scrolling, zoom, rotate, and flip. And you can slide in from the right border to call up the charm bar, or slide it from the left to switch between applications. The setup lacks distinct left and right mouse buttons, but you can click the lower area of the pad to obtain the same actions. 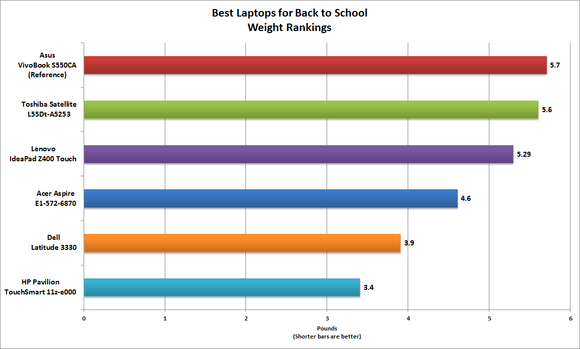 Weight is an all-important consideration when you're shopping for a laptop. Toshiba took advantage of the display’s width to provide a numeric keypad next to the alphanumeric keyboard. The half-size function keys in the top row have useful default actions mapped to them—including controls for such features as volume, brightness, and a media player. The island-style keyboard has short-travel keys that nevertheless provide a desirable amount of tactile feedback while remaining nearly silent. I wouldn’t have minded the half-size arrow keys if they hadn’t been located so close to the edge of the wrist rest. The entire keyboard is recessed in a well, making it nearly impossible to tell whether your finger is tapping the up arrow or the down arrow without taking your eyes off the screen to look. The Satellite L55Dt-A5253 finished third in our Notebook WorldBench 8.1 benchmark suite, a scant 2 points behind Lenovo’s Intel Core i5–powered IdeaPad Z400 Touch, but 16 points behind the Intel Haswell–powered Acer Aspire E1-572-6870. The Toshiba’s 750GB, 5400-rpm hard drive helped it grab a second-place finish in the PCMark7 Productivity component, but the faster CPU in the Acer Aspire more than compensated for that computer’s smaller drive. Toshiba provides the usual three USB ports on its Satellite: Two of these are USB 3.0 and you can use the one USB 2.0 port to charge your smartphone (or other USB device) even while the computer is sleeping—a very handy feature. The media card reader in the front of the PC supports only SD media. Aan HDMI-out supports digital display connections, and VGA handles analog. I don’t want to see HDMI go away, but I’d like to see laptop manufacturers include DisplayPort 1.2 ports on their consumer offerings. A DisplayPort 1.2 connection would let you daisy-chain displays, and you could buy an adapter to handle just about anything else, including VGA. 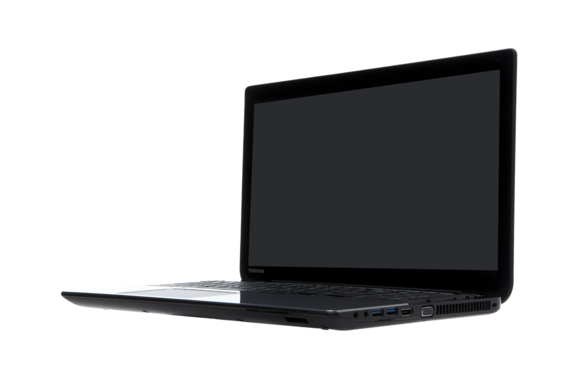 Like the Lenovo IdeaPad Z400 Touch, the Toshiba Satellite L55Dt-A5253 provides a single-band 802.11n Wi-Fi adapter that limits you to accessing overcrowded 2.4GHz networks; worse, the Toshiba’s Realtek RTL8188SU supports a maximum physical link rate of just 150 mbps, whereas the Lenovo’s Intel adapter delivers a 300-mbps maximum link rate and support for Intel’s WiDi media-streaming technology. Though the Satellite bears a DTS Sound logo, I found its audio capabilities wanting. Music sounded thin and flat, with very little of the oomph I crave from bass response. Stick with headphones, and you should be fine. Finally, this may reflect my right-handed bias, but I found it odd to access the Satellite’s DVD burner on the left side of the computer. The hardwired ethernet port—100 mbps max—is located here, too. The Satellite L55Dt-A5253 is a well-built laptop that delivers good performance, but many of its drawbacks don’t show up in its benchmark numbers: It’s weighs 5.6 pounds, its off-axis viewing is abysmal, and it has third-rate wireless networking capabilities. Clearly, it’s not the best notebook in this collection, but it’s still a decent value. This mainstream notebook won’t launch you into orbit, but it is a solid value.